This is the eight channel version of the Toft ATB series consoles, the Toft ATB08M. 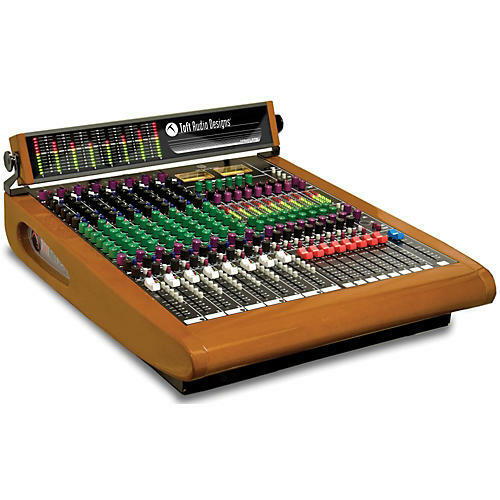 It is a beautifully made, handsome, great-sounding mixing console that is appropriate to live or recording environments. Over the years, the Trident Series 80B console has heard its praises time and time again for its excellent quality, pristine accuracy, and most of all, its premium vintage equalizer. This powerful combination produced an enormous amount of hit records and is still revered as one of the best analog recording consoles made to date. With so much history behind the Trident name, Toft Audio Designs is proud to announce that the Series 80 boards have been redesigned by the original designer himself, Malcolm Toft. The end result is none other than the new Toft ATB Series Consoles. The Toft ATB Console packs the same powerful equalizer that was used on the Trident Series 80 boards. The ATB's EQ section is regarded as one of the best sounding Equalizers on the market today! The super musical four-band EQ on the Toft ATB unleashes all your creativity without any limits or boundaries. The Toft ATB equalizer is your ultimate tool in your arsenal. The ATB consoles are an enormous success in the marketplace, thanks to Toft's loyal customer base. Toft Audio Designs continues to develop and improve the ATB platform with a range of enhancements, which ensure the highest performance, durability and ease of use. Among its many build features are reinforced metal standoffs. This type of pot has a metal frame which solders to the PCB, thereby providing structural support for the terminals. Think of it like each pot having its own little suit of armor protecting it from all manner of vibration, torsions and undue pressure...this change evolved to make the board more rugged and able to take more abuse! The ATB chassis has received a lot of attention from the engineers at Toft Audio Designs and now boasts an interlocking brace system, which provides precise vertical alignment for each channel card while mechanically decoupling them from stress on all axes. Think of this as a architectural retrofit that keeps the guts of the board more protected. The board also features an improved solo indication. No more frantic fingers running up and down the board to find that one depressed solo switch. The mute indicator is now a tri-color LED, which provides a channel-specific visual cue of "mute", "solo" and "mute-solo" states. The new ATB consoles also feature balanced direct outs and monitor outs. Toft Audio Designs insures that your projects get done with the quality and performance you expect out of a console descended from a long and successful heritage. The Toft ATB Series Console is loaded with a master control section only seen in more expensive, high-end recording consoles. The ATB features everything from the super accurate meters, wide-range of routing capabilities, talkback function, to the eight-bus mixdown section. From top to bottom, you have everything you'll need to take control of your mix and produce the best possible recording. Whether you are in a project studio or a major recording facility, the ATB is sure to impress even the most demanding critics. Group outputs: +26dBu balanced, +22dBu unbalanced into 2K?